I would like to thank Education Services for supporting this grant made by the RAB Trust. It goes towards strings and fittings for a viola and wood for two Strad model violins to be made during this school year. 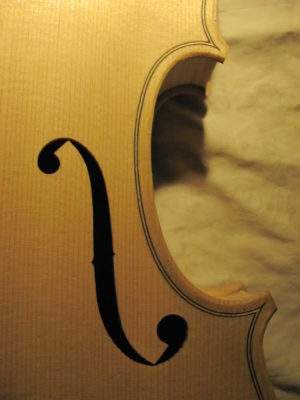 I’m in the process of varnishing a Girolamo Amati model viola made from some very special wood – finely figured maple for the ribs and back and a well-seasoned split spruce front. I took a lot of time trying to faithfully recreate stylistic details such as the sculptural, wide fluting of the back and the delicate, geometric scroll. I’m using an amber-based oil varnish and the figure of the maple is looking fantastic after the first coat! 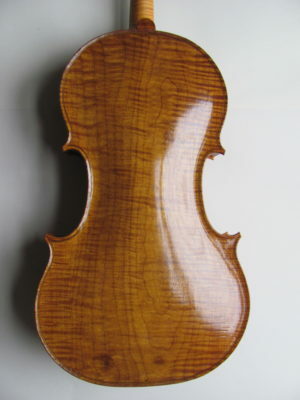 I’ve just finished making a violin based on Guarneri del Gesu’s iconic “Il Cannone”. His violins are celebrated by soloists for their dark, powerful sound and by makers for their highly individual stylistic features. I enjoyed cutting the pointed f-holes and carving an asymmetrical scroll, leaving lots of surface texture from the gouge. Most of all, I’m looking forward to hearing what impact the thicker plates will have on the sound, and building up an intuitive understanding of how the different measurements that can be made – mass, density, resonances, flexing to feel how stiff the plates are – relate to what we hear. Moving into my final year at the Newark School of Violin Making, I’m a little torn between the adventure of making new instruments, and honing skills – such as restoration work, setting up instruments, and bow rehairing – which are essential to finding work in this highly specialised field. The October half-term break will be spent at Christian Pabst’s workshop in Wuerzburg, where I will fit a large patch to the back of an old Bohemian violin and work on bridge cutting. 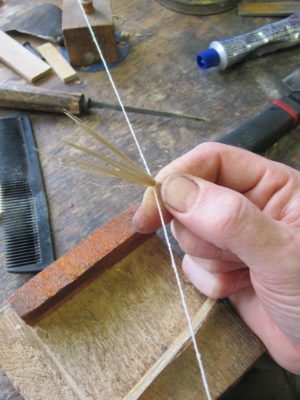 I’m looking forward to a day in London in November looking at bow rehairing with independent bow maker Stephen Thomson, a workshop placement organised by the RAB Trust. I would like to thank the teaching staff at NSVM and the violin makers who give generously of their time to host students for work experience placements. I’m looking forward to making two Strad model violins under the eagle eye of the final year tutors here at Newark, and am very grateful the the RAB Trust and Education Services for their encouragement and support in providing the wood”. Stephen Thomson, bow maker and restorer, hosted me for a workshop placement on the 5th of November. I’d been introduced to the world of bows by Chris Halstead as part of the second year teaching here at NSVM. I was keen to brush up on my rehairing, and have a look at a couple of parts of the process where I was having trouble achieving a consistent result. We started the day with a demonstration – Stephen rehaired a silver-mounted Hill bow from his stock. I had been having some difficulties keeping the hair parallel and under even tension across the ribbon when tying the second knot for a rehair. Seeing how Stephen manipulated the hair at this point, and held the ribbon in a comb while presenting it to the head mortice, helped me to better understand how to keep control of the process at this crucial point. Watching Stephen fitting the wedges was also useful, as I realised I’d been wasting a lot of time fitting wedges far taller than they needed to be. I then rehaired a Paesold bow from the shop stock. Since I was getting used to a couple of different techniques, it took slightly longer than usual, but the result was an even band of hair, with the hairs parallel and just the right length. After lunch, we had a look at artificial whalebone lappings and thumb leathers. I hadn’t done this kind of lapping before and thanks to the demonstration, I was able to complete one on my own back in Newark later in the week. The day concluded with a short recital of Irish jigs and passages from Bruch’s violin concerto, played on one of my own violins with Sartory and James Tubbs bows. I really enjoyed having the chance to play on these fine bows, many thanks! I’d like to thank the Rowan Armour-Brown Trust for organising this placement, and Stephen for his generosity with his time and giving me his bench for the day. I have a clearer understanding of how the rehairing process is done, and am now achieving a better result more quickly and consistently. Thank you!